It seems these days every dentist specializes in dental implants. Truth is just because a dentist may provide dental implants doesn’t make him/her a specialist. It takes years of schooling and education, training and research about the latest technology and techniques. So it is important to research who you choose if you are looking for a dental implants dentist in Oreland. If something happens to your tooth, it is possible you may lose it. But if something goes wrong with your dental implant your whole body is at risk. If you don’t take the time to find out who you are dealing with for your oral health, you may end up with more problems than you started with. When people talk about dental implants sometimes there is confusion about what it actually is. A dental implant is a post- a medical grade titanium piece of metal that is implanted into the jaw where the missing tooth used to be. 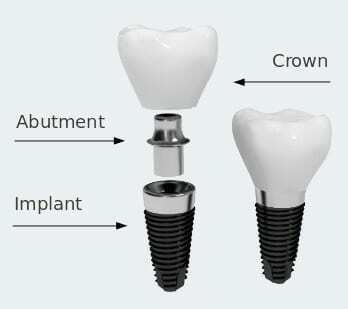 The abutment is simply what connects the dental implant to the crown. The crown is what you actually see. The replacement tooth can be made of metal, resin, ceramic or porcelain fused to metal. It can be customized to match your existing teeth. What Dentist is Best For Dental Implants Near Oreland? With a combined total of 30 years of experience, Dr. West, and Dr. Wilk will create a dental implant solution that will cosmetically correct your issue. Jenkintown Dental Medicine has already implemented dental solutions for your neighbors in nearby communities like Glenside and Abington. Call your dental implants dentists near Oreland at Jenkintown Dental today at 215-885-6565.